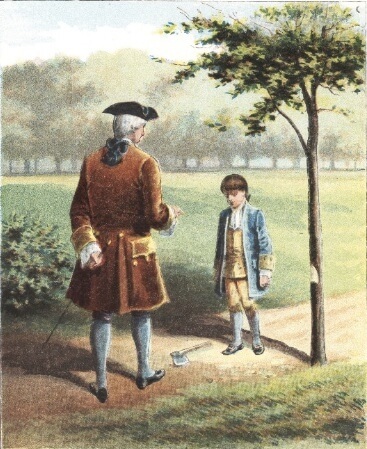 The following story about young George Washington is from Josephine Pollard's book, The Life of George Washington: In Words of One Syllable (1893). Washington wrote these rules in his notebook when he was 13 years old. You might also enjoy reading George Washington: A Child's Biography, and the chapter book for older children, The Story of George Washington. George wrote out one hundred and ten "Rules," which were to guide him in act and speech at home and abroad. Some few of these I will give you, that you may see at how young an age this boy set out to train himself, and fit himself for the high place he was to fill. It almost seems as if he must have known the high rank he was to take; but this could not be. His soul was fixed on high things; he had; no low tastes; and he was led by the hand of God. Here are some of the rules that George Washington took as the guide of his youth. "In the presence of others sing not to yourself with a humming noise, nor drum with your fingers or feet. "Sleep not when others speak, sit not when others stand, speak not when you should hold your peace, walk not when others stop. "Turn not your back to others when speaking; jog not the table or desk on which an-o-ther reads or writes; lean not on any one. "Read no letters, books, or papers in company; but when there is a need for doing it, you must ask leave. Come not near the books or writings of any one so as to read them, un-less asked to do so, nor give your opinion of them un-sked; also look not nigh when another is writing a letter. "In writing or speaking give to each person his due title according to his rank and the cus-tom of the place. "When a man does all he can, though it succeeds not well, blame not him that did it. "Be slow to believe evil reports of any one. "Be modest in your dress and seek to suit nature rather than to win admiration. Keep to the fashion of your equals, such as are civil and orderly with respect to times and places. "Play not the peacock, looing all about you to see if you be well decked, if your shoes fit well, your stockings sit neat-ly, and your clothes handsomely. "Make friends with those of good character, if you care for your own reputation, for it is better to be alone than in bad company. "Speak not of doleful things in time of mirth, nor at the table; speak not of mourn-ful things, as death, and wounds, and if others mention them, change, if you can, the discourse. "Utter not base and fool-ish things 'mongst grave and learned men; nor hard questions or subjects a-mong the ignorant; nor things hard to be believed. "Be not forward, but friendly and courteous; the first to salute, hear, and answer; and be not pensive when it is time to converse. "Gaze not on the marks or blemishes of others, and ask not how they came. "Think before you speak, pronounce not imperfectly, nor bring out your words too hastily, but orderly and distinctly. "Treat with men at fit times about business; and whis-per not in the company of others. "Be not curious to know the affairs of others, nor go near to those that speak in private. "Undertake not to do what you cannot perform, but be careful to keep your promise. "Speak not evil of the absent, for it is unjust. "Make no show of taking great delight in your food; feed not with greed-i-ness; cut your bread with a knife; lean not on the table; neither find fault with what you eat. "When you speak of God, let it be gravely and in reverence. Honor and obey your parents, although they be poor. "Let your amusements be manful, not sinful. "Labor to keep a live in your breast that little spark of celestial fire, called conscience." It is not known where George found these rules he took so much pains to write out, but it is plain that he set great store by them, and made use of them through out his whole life. You may also enjoy George Washington's biography, featured in our collection, American Biographies for Kids. Visit American History to find out about other important people and how their writings helped shape the country.